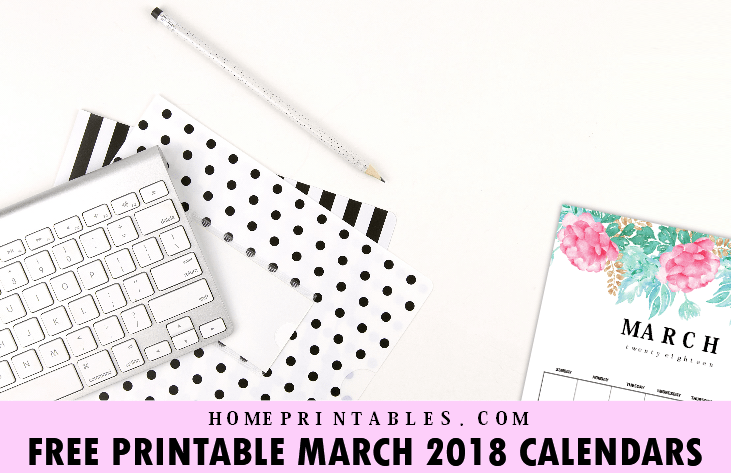 March 2018 Calendar: 10 Free Printable Planners! 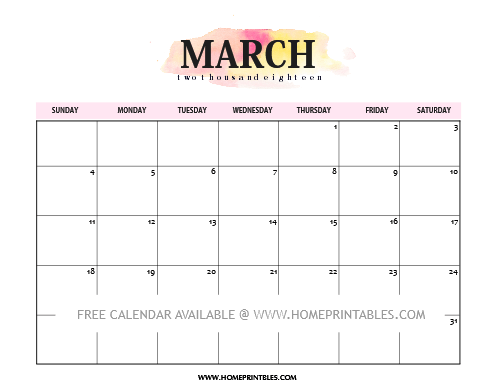 Looking for a March 2018 calendar to print? We’re happy to let you know that we’re already releasing your free printable calendar planners today. Scroll down to download to view the beautiful designs that we are giving away. You will find a calendar that you will love to use from this set, that’s for sure! 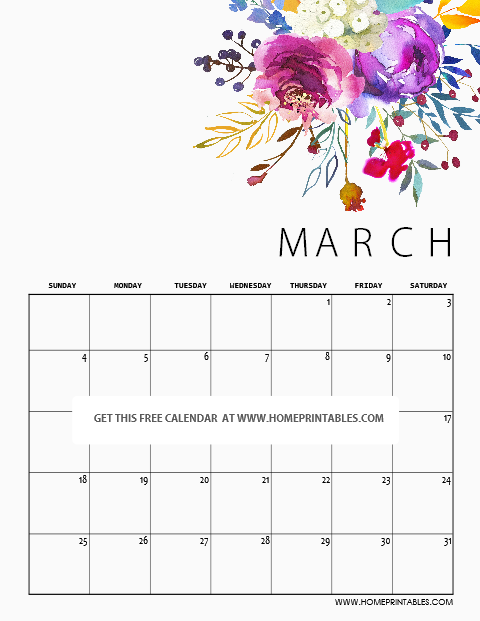 Welcome to Home Printables’ monthly calendar release series. If you’ve been following the blog, you know for sure that we do release free calendars on a monthly basis. We believe that planning ahead can help you achieve more so we’re already sharing your free weekly calendars in advance! Keep scrolling to preview some of the designs that we have! 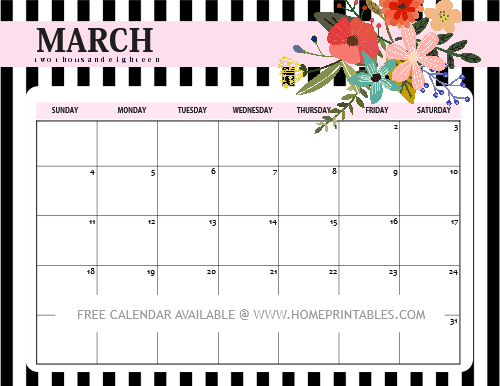 Home Printables’ Free March 2018 Calendar Set: 10 Pretty Designs to Love! We’re happy to let you know that we are sharing away 10 pretty calendars from this set. Each of these calendars comes in unique print. Thanks to the amazing creators at Creative Market for some of the graphics we used in designing your free March 2018 calendar. We’re hoping that they can really help you organize your activities and plans for the month! 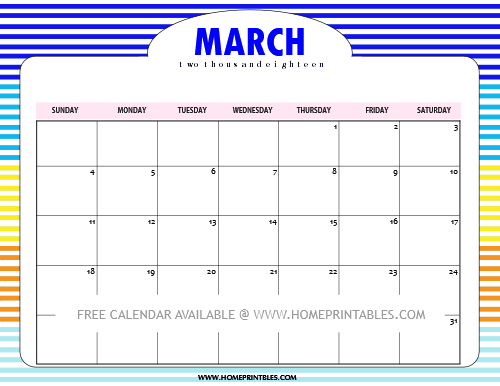 Here then are the free March calendars that you can snag for free! Who here loves to use a calendar with nature-inspired design? Take a look at this first calendar that we are showing you. Isn’t it gorgeous in subtle watercolor nature-inspired print? This, for sure, will ring in bliss in your daily planning as it looks so refreshing! The second calendar that we’re giving away is actually from our 2018 floral calendar set. Adored by many, we though of sharing it again for this month. Do you like to use this calendar design for the rest of the year? Please get the entire set HERE. This March 2018 calendar design is one of our favorites ever, we must say. You’ve probably seen this design here in the blog in the past months. We just love sharing it over and over because we love its playfulness and elegance. 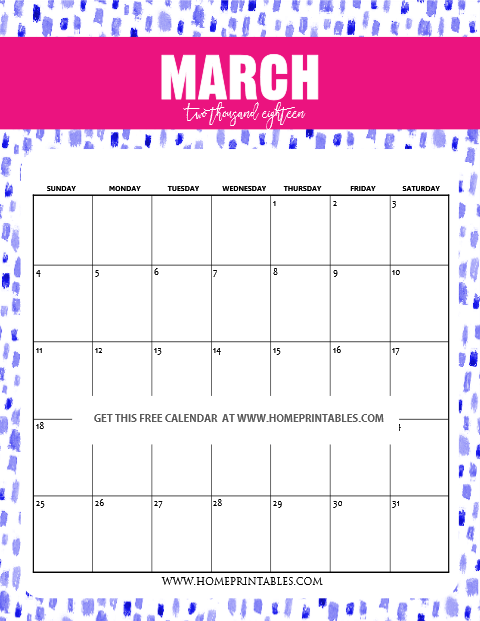 You can definitely print this out to use a meal planner, blog planner and more! Looking for a calendar to print for the little ones? They might love to use this colorful and playful March 2018 calendar. What’s nice about this calendar is that they can inert it in their school binder to get organized in school. This is great to use as exam planner, homework tracker, project planner and more! 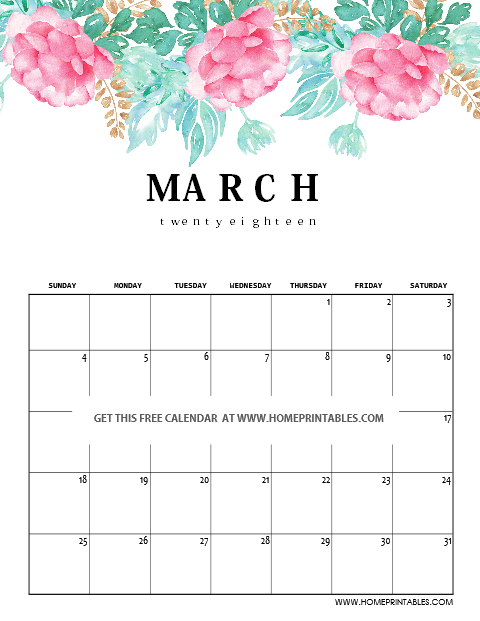 Moving on, the next free March 2018 calendar printable that we’re sharing away definitely comes out gorgeous in beautiful,beautiful florals! This makes a great calendar planner to use in your office or even in your homes. Use it as a work planner or kitchen planner! In need of a calendar that’s just basic and simple to use in your everyday organizing? 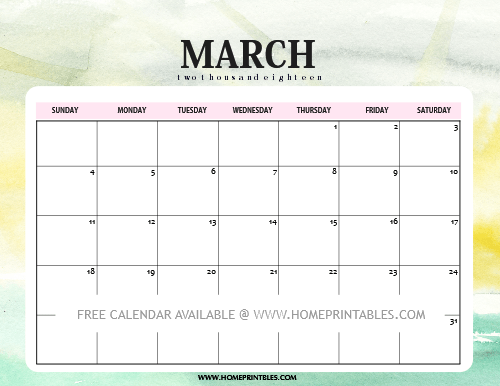 This March 2018 calendar template could be the one you’re looking for! It has wide spaces for your daily planning and scheduling. And oh, just in case you’re also in need of a calendar template in MS Word that is completely editable, go snag it HERE. The next calendar that we’re sharing away comes pretty in stripey background adorned with flowers. Calling all the giggly ladies out there, you might like to use this planner to plan out your month! The next one that we’re sharing away is a playful calendar that is sure to inspire creativity monthlong! While we designed this calendar for the school kids, you can surely use and enjoy it, too! Last bu definitely not the least of them all is this pretty calendar that comes in beautiful watercolor background. Use this pretty planner to get organized at home and in your workplace! Get the two calendar files. Go HERE to get the calendar in vertical orientation and HERE for the horizontal ones. 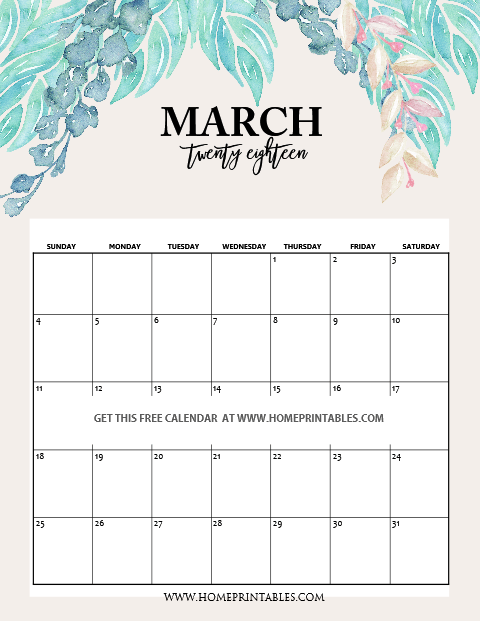 The vertical calendars are exclusive for the Home Printables newsletter subscribers so join now to receive the planners sent straight to your inbox. Pick the calendar design that you like to use. In case you need a different calendar to use for your meal planning and events calendaring, feel free to print more than. Print off the calendars in US standard Letter size paper. Use the calendars to organize your schedule! 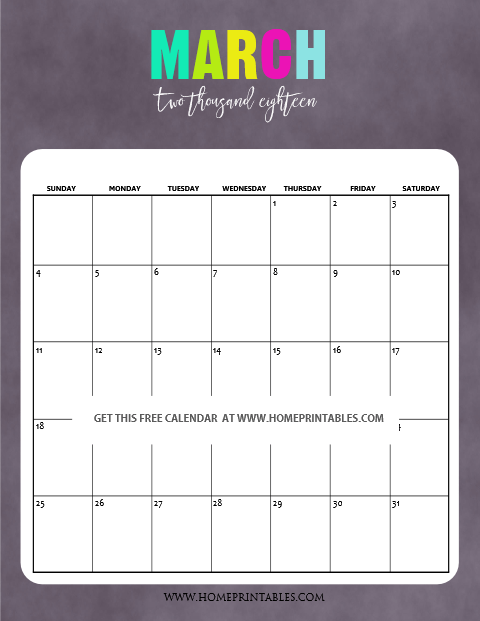 Loving these free printable March calendars? Help us spread the freebie by pinning this post on Pinterest! Thank you! May you have an awesome March. Happy Planning!